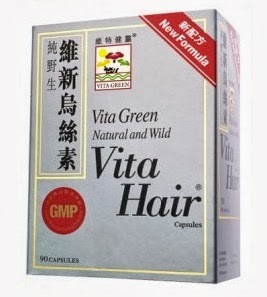 Vita Hair – Herbal Formula to Halt Hair Loss and Greying! Thanks Vita Green Sponsoring me 3 months supply of Vita Hair! Vita Hair has just launched in Singapore! It is a top selling products in Hong Kong and sold out almost 2 months upon launch in Hong Kong. Improves blood circulation and nutrient supply to the hair follicles, regulates hormones and strengthens the kidneys to restore colour and thickness to thin, greying hair. Hair loss and graying are seen as signs of aging, yet frequently they can strike in early adulthood. Hair growth is affected by our hormones, which can be easily upset by factors such as menopause or pregnancy. According to Traditional Chinese Medicine, deficiencies in the blood can also take a heavy toll on hair’s health. Western medicine offers no real answers, but fortunately there is a safe, reliable and effective alternative. Vita Hair helps to halt hair loss and graying of the hair with a blend of potent herbs formulated according to the principles of Traditional Chinese Medicine. These improve nutritional supply to the hair follicles, regulate hormones and strengthen the kidneys. Vita Hair can also restore graying hair to its original color by stimulating the cells that produce pigmentation. Since even healthy hair grows very slowly, it is recommended you take Vita Hair continuously for three to six months in order to see an improvement. My reviews: I have been taking Vita Hair for almost 2 months, I seen great improvements on my hair conditions. I always have this hair loss problem, after taking Vita Hair for 1 month, it minimized my hair loss problem and my hair looks healthier and darker. Definitely will recommend it to my friends and relatives! Mayday 五月天 NOWHERE 诺亚方舟 3D Movie!